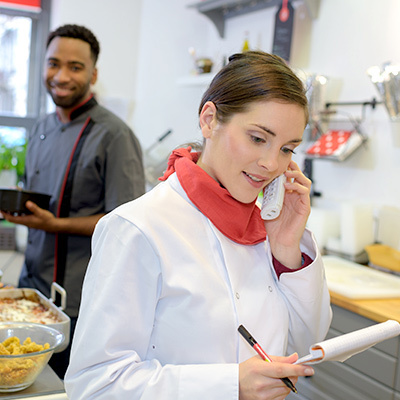 If you're a Quick Service Restaurant business is in need of an ultra-reliable communications solution with unlimited scalability, you need Star2Star. 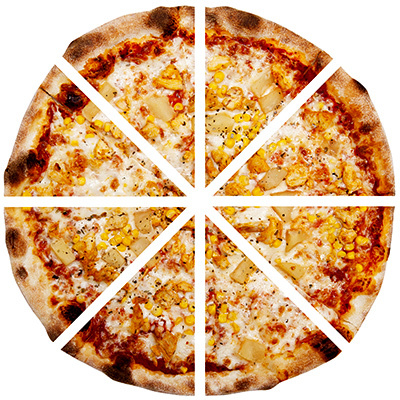 Star2Star benefits our customers in many ways, from cutting costs to adding critical functionality, and this is especially true of our restaurant customers. 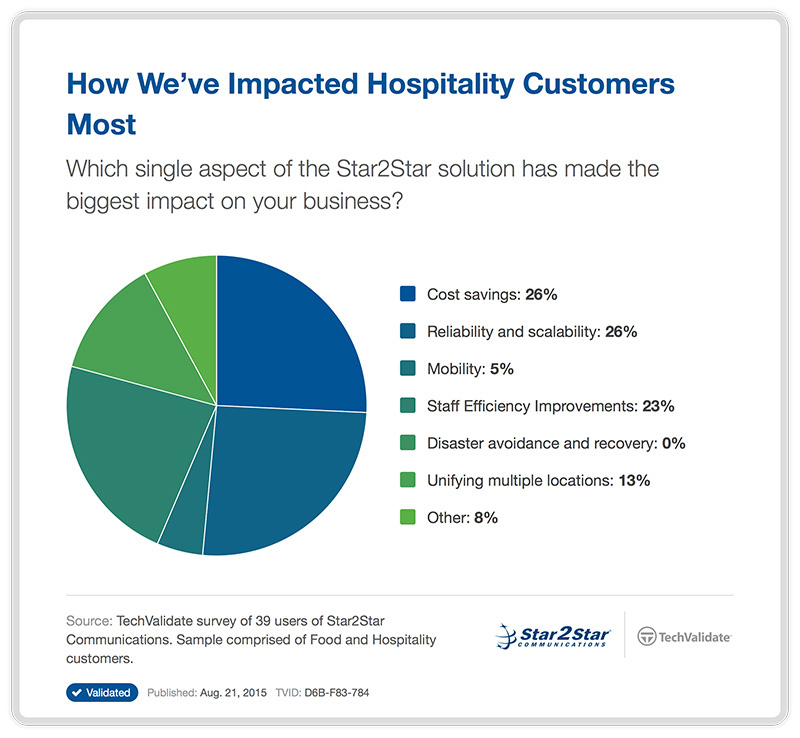 This chart demonstrates how different aspects of our solution impact our hospitality customers. As you can see, our solutions solve many different business problems. The fact that so many different aspects of our solutions impacted customers the most really shows just how powerful our entire solution is and how we’re strong all around, not just in one area. This is especially important to an industry with as many distinct needs as Quick Service Restaurants that has often in the past had to choose between meeting one need at the expense of others. 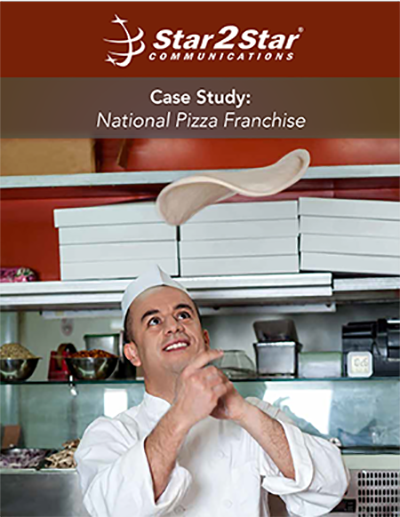 Quick Service Restaurants, especially chains and large franchise operations, depend on analytics to properly schedule employees and track their performance. Star2Star offers several real-time analytics solutions. StarReporter, which is independent of our contact center solutions, provides 13 different popular reports that can be provided on command or on a scheduled basis. StarCenterTM is a complete, full-featured inbound call center only available from Star2Star that keeps users on the cutting edge. StarCenter’s StarView reporting provides the critical information that Quick Service Restaurants need to function at peak level. The faster that your agents can handle a call, the more calls they can handle and the higher your customer satisfaction will be. StarContactTM integrates your company's customer database with your Star2Star communications system. This powerful CRM integration allows you to organize, track and manage all of your customer information, activities, and conversations. StarContactTM provides functionality for both inbound and outbound calls. 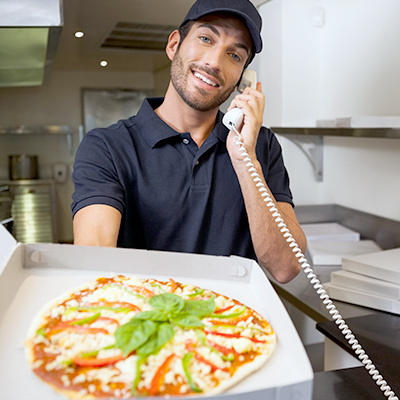 Incoming calls display customized "screen pops" containing information about the customer, including details on contact information or other CRM available fields for previous calls, interactions and orders. These "screen pops" allow users to know all about the customer and their past interaction before they even pick up the call. A restaurant that is unable to take orders is in deep trouble. The razor thin margins that many Quick Service Restaurants operate under makes this situation even worse. Star2Star guarantees 99.999% uptime reliability, and has provided 100% voice uptime since 2011. Even better, our extensive suite of disaster avoidance and recovery protections make sure that your calls keep coming in even if one of your locations is inaccessible due to disaster. Even better, our unique Hybrid Architecture provides the highest call quality in the industry. There's a reason that Star2Star has a 99.85% customer retention rate!